"For some reason, German BBs are so satisfying to play" - a BB hater. This is why I like German boats so much in this freaking game. Sauerkrauts of all trades. And yes, GK's in-file name is "Grossdeutschland". Any idea on how I might open it? I can't seem to open the file, do I need a mod manager? It's somewhat cumbersome that WoWS doesn't have an option to open replays while I'm already in the game. The KMBB is a special breed of ship. I've got ships in every line but still think the German ships offer the most fun playstyle of all of the BB's. I started the game in alpha with an aversion to sniping and I still close the gap in ships I don't need to, but my Bismark/Tirp/Sharn are still what makes me enjoy splattering any ship that closes the gap on me. Secondary builds all the way. The BMBB is a special breed of ship. I've got ships in every line but still think the German ships offer the most fun playstyle of all of the BB's. I started the game in alpha with an aversion to sniping and I still close the gap in ships I don't need to, but my Bismark/Tirp/Sharn are still what makes me enjoy splattering any ship that closes the gap on me. Secondary builds all the way. BMBB? What unfathomable abbreviation there? Yeah. What I like the most about German ships is the fact that they aren't great at any one role, but they can switch roles in battle when needed and still do quite swimmingly. Unlike most other ship lines which cannot provide such deep versatility. Knowing when to switch roles and what roles to switch is something I'm still wading through, though. You said you hate BBs. Also, do you enjoy FDG? I'm stuck with Bismarck and thinking "Should I skip her? or just continue the grind with FDG?" Since she's being recently buffed. I don't like most BBs in the game, yes. But German BBs have what I want, mostly good turret traverse and quick-firing main guns Their rudder is horrible though. FdG? I wouldn't say these are good advice, but some recommendation that you could consider. Main Battery Mod 3 for Slot 6, AR for 3-point captain skill. Don't use Spotter Planes. Don't bother research the module FCS B. FdG has generally horrible dispersion, so staying within 16km is good enough. 406 or 420 is up to your preference. You may want to use your main guns and get yourself damaged a bit for the beginning of the match to activate AR. If you get a fire, let it burn out. Stick with an allied ship (radar cruiser or any ship with Hydro). When the battle goes sour and there's 0% chance of winning, I'll just charge into the enemy and deal as much damage as I can. @Paladinum So the whole point of playing German BB is to farm as mush damage as possible and sacrificing a lot of HP? 1. This game is about farming as much damage as possible. 2. If you prefer brawling then you will get damaged anyway. 2. If you prefer brawling then you can't avoid being damaged. Well ya. But my problem when brawling with German BB is that, I can't consistently do damage to enemies whilst also keeping myself alive. When I get detected, I will be detected for long and I can't spot that goddamn DD or cruisers who hide behind islands. Hydro may help. But what use? It only detect torps anyway. Cruisers with radar may be a good friend. But how if I have none in my team? Also not to mention the ridiculous amount of cruelty in high tier match. My own experience with 24km range GK: pleasant. Good AA, decent guns, good secondary (19 point captain with Manual Secondary for maximum secondary punishment, everyone hates that). I know that when I get bad results it's usually my own doing. 100k+ damage games are mostly easy when I know what I should do. THIS I am serious of. And then we came to the economy game. Which in tier 10 is very expensive. Sometimes I do 100+ damage games but my credits always deducted. Is this means that it is a must to equip some economy signals and camos in T10? I also heard that absorbing damages can also reduces the amount of post battle service quite a bit. But died in the battle will reset the amount of it. Thanks Paladinum for the suggestion. I will try that out too on my GK :) Recently with CV around it has become very difficult to get close to anything, not to mention a lot of maps with not much cover makes GK couldn't even get into her (eh, His) main gun firing range of 20.6km. Tried full concealment, no help; tried "screw it, I go full secondaries with legendary mod" also failed horribly. And then we came to the economy game. Which in tier 10 is very expensive. Right now I only play GK and other non-prem ships when I have Prem time (bought from the Arsenal/Armory with event resources). Otherwise I'd play my Salem and Alaska, making positive income every match even with consumable expenses. Thanks Paladinum for the suggestion. I will try that out too on my GK 🙂 Recently with CV around it has become very difficult to get close to anything, not to mention a lot of maps with not much cover makes GK couldn't even get into her (eh, His) main gun firing range of 20.6km. Tried full concealment, no help; tried "screw it, I go full secondaries with legendary mod" also failed horribly. If all BBs in the game (primarily the Germans) adopt the RU BB dispersion mechanic, Would you think that it can change the current meta? The thing that needs to change the most is player's mindset. 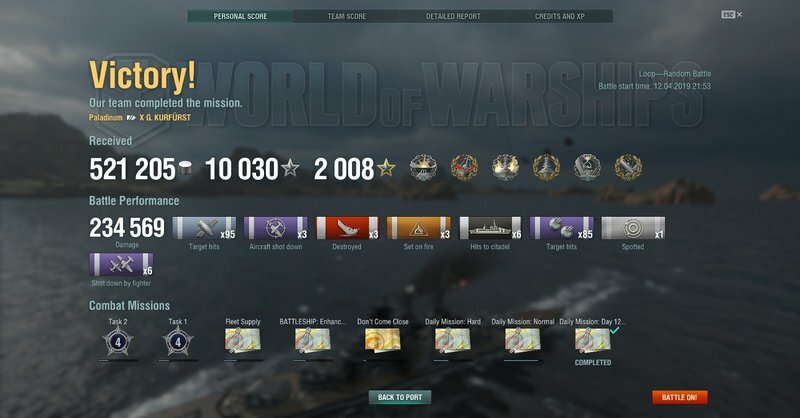 Then it's the game mechanics, like BBs shouldn't be afraid of most DDs (although, generally speaking, DDs counter BBs), incentives (taking damage should be rewarded and rewarded more) and an accuracy penalty ((all ships) will have their sigma drops to unplayable if shooting beyond a certain range, BBs should have a larger penalty than other ship types). Just because they have 24km range doesn't mean they should shoot from that distance. But WG aren't doing anything to punish that mindset. In BB the most I feared is DD, The one I hated most is CV because I have no place to hide. In GK i used to tank a lot of damage, did comparable damage to enemy as in other BB (e.g. Yamato, Montana) But the rewards is poor. It actually feels quite the same as 420mm with faster reload mod. 420 mm would overmatch more ships than the 406, but... faster reload. Eh? I didn't realise 420mm does cross any significant armor value compared to 402mm in overmatch. Will check that out. I can be wrong, as always. But German 420 mm have the same AP damage of US 406 mm (Iowa/Montana). So if you want to pummel BBs, pick 420 (I guess). But German 420 mm have the same AP damage of US 406 mm. So if you want to pummel BBs, pick 420 (I guess). My previous experience with 406 was it tend to ricochet upon hitting target. That's the reason I stuck to 420 since I got the GK. However recent try out appear 406 is not inferior to 420, at least from what I feel, in terms of the chances of ricochet..